Governments, motivated by a desire to improve upon long-run laissez faire, routinely undertake enduring, productive expenditures, say, in public education, that generate positive externalities across cohorts but require investments be made up front. If everyone after the policy is initiated is at least as happy as before and there are some outstanding resources, the Hicks-Kaldor efficiency rule suggests that the present value of these resources could, hypothetically, be distributed to future generations creating the potential for generational Pareto improvement. 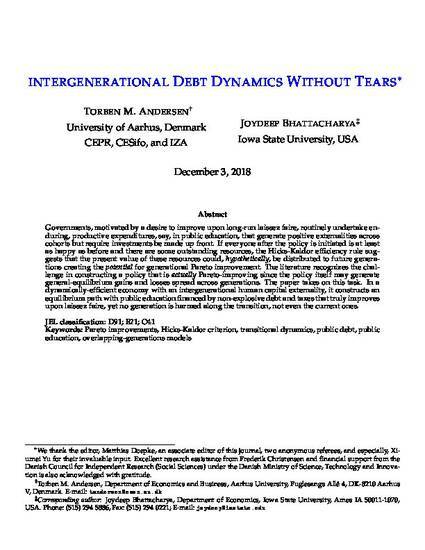 The literature recognizes the challenge in constructing a policy that is actually Pareto-improving since the policy itself may generate general-equilibrium gains and losses spread across generations. The paper takes on this task. In a dynamically-efficient economy with an intergenerational human capital externality, it constructs an equilibrium path with public education financed by non-explosive debt and taxes that truly improves upon laissez faire, yet no generation is harmed along the transition, not even the current ones.